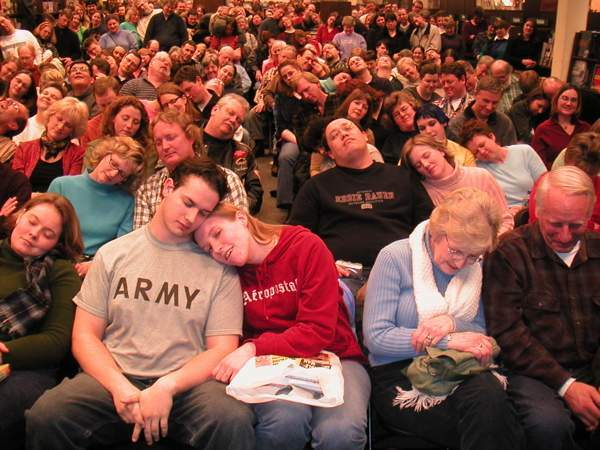 Are Americans Under Mass Sedation? The takeover of America in 2000 and again in 2004 by George W. Bush and that gang gathered with him at the Capital, with hardly a word of protest from the people, remains a surprise and a shock to a lot of clear thinkers. That a majority of voters in America would shift back to a Republican House majority in 2010 mid-term elections, after the extreme economic collapse brought on during the Bush years, and that citizens would stare blankly at their television screens after the U. S. Supreme Court gave private corporations the power to dump secret donations of money into political campaigns, also boggles the mind. That silly minded women like Sarah Palin, Sharron Angle, and Christine O’Connell, although unsuccessful in their bids as candidates for elected office, should rise in popularity and trumpeted by the media, even after the elections are over, makes us shake our heads in disbelief. I have tried to understand the mindset of the masses while watching these events. The 9-11 attack was severe and while we were all left shocked by it, for me there was still a presence of mind to be aware of the fact that the Patriot Act, the stripping of our personal freedoms in exchange for government protection was not the way to go. Yet as a working news reporter covering city and county government in a politically Republican area, I was unable to convince any of the community leaders that the Patriot Act, the unprovoked declaration of war against another country, and even the Bush attack on our environment, were wrong. Their eyes glazed over when I broached the subject. When it comes to Bush, the man seemed to be unable to do anything wrong. Instead of being arrested and charged by an international court for war crimes, this man is boldly promoting his autobiography which reinstates his guilt and literally dares the world to do anything about his crimes. What has happened to the people? It is almost as if we are living among a nation of zombies, all of them asleep. Where are the thinkers? How can this be happening? Has our education system fallen into such disrepair that we are cranking out a nation of brainless and illiterate robots? Or is it something more sinister? We know that the military has been cranking up HAARP since 9-11. This writer can feel it every time those low frequency radio waves are passing through my space. Dr. Nick Begich and Jeane Manning suggested in their book Angels Don’t Play This HAARP that the device might be effective in mass mind control and I have wondered about this. I have also reported on a variety of other possible ways the government might be using to subdue the people and prevent political disorder. A story in the London Observer in 2002 said the American military was developing ways to use the well-known tranquilizer Valium to control hostile populations. The way most Americans are behaving these days, we must wonder if we aren't already getting doses of this drug mixed with our water supply or popular beverages like beer or Coke. Since I don't drink tap water, beer or Coke, I appear immune to such a tranquilizing effect, but many others may not. Perhaps something is getting into our lungs with all of the other debris from those mystery contrails our Air Force is laying across our skies. We may also suspect that all of the monosodium glutamate (MSG) and Aspartame in the soups, prepared foods and soft drinks people consume is killing so many brain cells it is having an impact on society. I think the sell-out by the media has been at the root of America’s problem. Notice that the major newspapers and television news networks are being bought up by major corporations. There is little if any competition now among them. When American journalists fail to ask hard questions and seek balanced news stories about key events, the information we need to know is lost or buried under the mire of celebrity and crazy political news. When the smiling television news anchors assured us that Saddam Hussein was an evil dictator who needed to be put out of office, that the Iraq war was justified, that business was booming under Bush, and that all was well with the world, the sheep remained subdued. Now they are out of work, losing their homes, living in the streets and angry because the Obama Administration cannot fix their state of affairs so they can return to their couches with their nightly six-packs to watch football as usual. But still they remain placated. How can this be? There have been a few fighters. They organized the Tea Party movement, which was quickly drawn under the control of big money interests posing as friendly champions of a quest for change. They were wolves in sheep’s clothing, however . The would-be revolt was quickly squelched, the Tea Party folks were betrayed, and the nation has fallen back into the mess it has been in for more than a decade. There is but one bright light to be seen. It is that clear voice in the crowd of candidates for the presidential post in 2016. He is Bernie Sanders, a Virginia Independent senator who has posted his name on the Democratic Party ticket. Sanders seems to see the reality of our nation's dilemma and he wants to do something about it. The media is all but ignoring Sanders, but he is drawing massive crowds where-ever he speaks. Is it possible that enough people are waking up enough to put this man in office next year? And if they do, will he be given the support he will need in the House and Senate to set things right again? With the rich corporate bosses pouring truckloads of cash into the bankrolls of chosen sold-out candidates, and all of that money going into smart and deceptive television advertising and slanted news reporting, the odds are against it. And from this re-emerges our theory that the dumbing-down of America has been successful. The sheep are at last prepared for enslavement in the corporate labor camps for non-union and low wage workers.